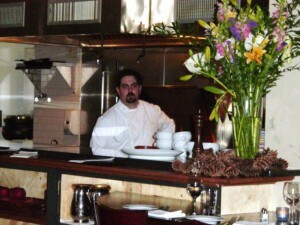 RESTAURANT ALBA, 7 West King Street, Malvern, PA, (610) 644-4009, www.restaurantalba.com: Originally a BYOB, in December 2011, Alba’s proprietor/chef Sean Weinberg and his wife, Kelly, broadened the restaurant’s horizons by adding a full service bar and a decidedly interesting, predominantly Italian wine list. 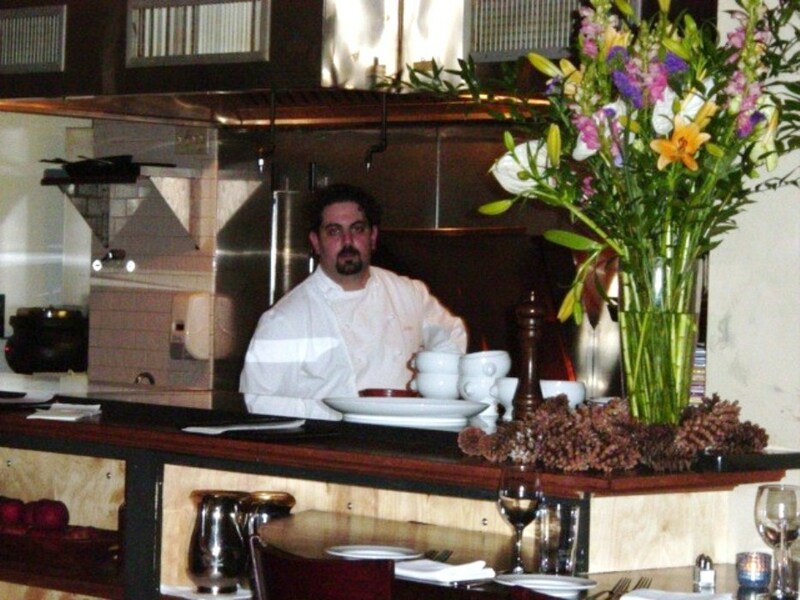 Mr. Weinberg’s eclectic menu – with meats and seafood kissed by his open kitchen’s wood-fired grill – continues to give full vent to his passionate and inventive culinary spirit. The various takes on bruschetta make excellent starters, as does the inordinately tender octopus. And while his grilled presentations, particularly the finny fare, continue to draw praise, his extraordinary pasta dishes are also worthy of consideration, with the wild boar ragú teamed with pappardelle reigning supreme as this diner’s personal favorite. Searching for a suitable side? The smashed fingerling potatoes with horseradish crème fraîche are nothing short of sensational. And bear in mind that, in addition to an array of excellent desserts, the restaurant also serves up a first rate artisan cheese plate. CRAFT ALE HOUSE, 708 West Ridge Pike, Limerick, PA, (484) 932-8180, www.craftalehouse.com: Not only does the Craft Ale House specialize in local craft-brewed beers and an impressive selection of beers & ales from around the world, the restaurant is also committed to environmentally friendly practices by offering its patrons seasonal cuisine that is sourced from local farms and vendors. If you’re a “pub grub” addict, Craft serves healthy, spruced up versions of some of your favorites – the house-ground all-natural Pineland Farms pub burger, for instance… ditto the slow roasted pork sandwich, fish & chips, and delightfully creamy, smooth-as-silk chicken potpie. In contrast, entrées proper offer diners more adventurous possibilities – like the vegetable Napoleon, free-range chicken breast stuffed with pumpkin, Swiss chard, Raclette cheese and finished with apple cider gastrique, and the brown sugar- and paprika-rubbed Korean-cut short ribs. Craft turns out several scrumptious house-made desserts, which vary depending upon the season and the chef’s inclinations. 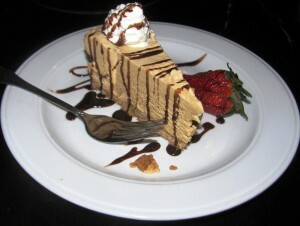 However, when it is available, nothing quite matches the incredibly delicious chocolate peanut butter pie. Although the restaurant only possess a Pennsylvania beer license, if you tote along your favorite wine, the friendly staff will be happy to provide an appropriate setup with no corkage fee. ELLA’S AMERICAN BISTRO, 214 Sugartown Road, Wayne, PA, (610) 964-3552, www.ellasamericanbistro.com: Ella’s interior is coolly contemporary yet classically comfortable. 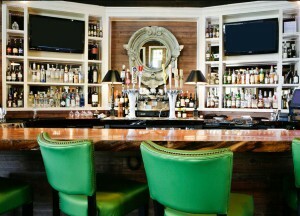 An inviting 22-foot sycamore bar is complemented by antique copper accents and rough-sawn plank walls, all of which contrast nicely with modern high-top tables and Kelly green chairs. The main dining area – decked out in floor-to-ceiling windows, natural materials, and equestrian memorabilia – is more formal but still quite cozy. Unfortunately, service is decidedly spotty and Chef Chad Jajczyk’s eclectic cuisine is something of a mixed bag. Appetizers – like the picture-perfect house-made country pâté, Asian scallops, and roasted beet & spinach salads – generally acquit themselves reasonably well, but entrées are more prone to stumble. The skate-wing, for example, was drowned beneath an overly viscous, incredibly salty lemon caper butter sauce; and the salmon filet’s honey-pepper sauce proved entirely too sweet for its own good. Even “Ella’s Classic Burger,” though ordered medium, arrived dry and woefully overcooked. On the other hand, desserts, courtesy of pastry chef Ayanna Sims, are exceptional. Despite the various faux pas, Ella’s is still worth a visit, more so for lunch than for dinner. And definitely settle in the bar area, where the atmosphere is more laid back and the restaurant doesn’t take itself quite so seriously. FIREBIRDS WOOD FIRED GRILL, 51 Center Avenue, Providence Town Center, Collegeville, PA, (484) 902-1850, www.firebirdsrestaurants.com: Firebirds is something of an acoustical nightmare, with high ceilings & a plethoric variety of hard surfaces producing eardrum-shattering decibel levels. Apart from the, at times, nerve-jangling ambiance, the food is problematic. To describe same as “hit or miss” would, indeed, be charitable. During a first-visit, shortly after the restaurant opened, the vittles proved surprisingly good. The second visit, however, was a complete disaster. A cheeseburger was overcooked and extremely salty; and the accompanying fries exhibited the appetizing taste & texture of Styrofoam-infused cardboard. Even with all its faults, however, the dish was still semi-edible… Not so the meatloaf, which could only be described as horrid. The meat had absolutely no taste, and the flood of mushroom gravy was undeniable proof that someone in the kitchen had run amuck with a salt shaker. And to add insult to injury, service here is like playing Russian roulette. Even with some heavy hitting corporate backing, given the inferior quality of the cuisine, the almost obscene noise level, and the non compos mentis service it will be a minor miracle if Firebirds can survive at this location. With so many good restaurants in the immediate vicinity, it makes absolutely no sense to waste your hard-earned money here. GINO’S RISTORANTE & PIZZERIA, 2401 West Main Street (Ridge Pike), Norristown, PA, (610) 539-0155, www.myginos.com: Gino’s loyal clientele is an eclectic mix – couples, families, parties large & small – and the majority of patrons generally have a bottle of wine in tow (the restaurant is BYOB). Good food deserves the accompaniment of good wine, and diners here are knowledgeable enough to respond appropriately – and that’s a very positive sign. 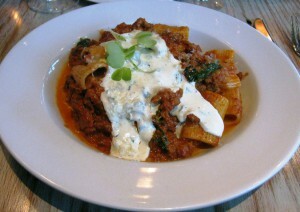 The food is uncompromisingly southern Italian; and portions are prodigious. Among the main courses, veal is a solid choice – and it is the real deal, beautifully textured and pleasantly chewy of countenance. Al forno, baked items, like the superlative thinly sliced eggplant parmesan, lasagna, manicotti, and cheese ravioli, are equally well-prepared and bordering on gargantuan in stature. 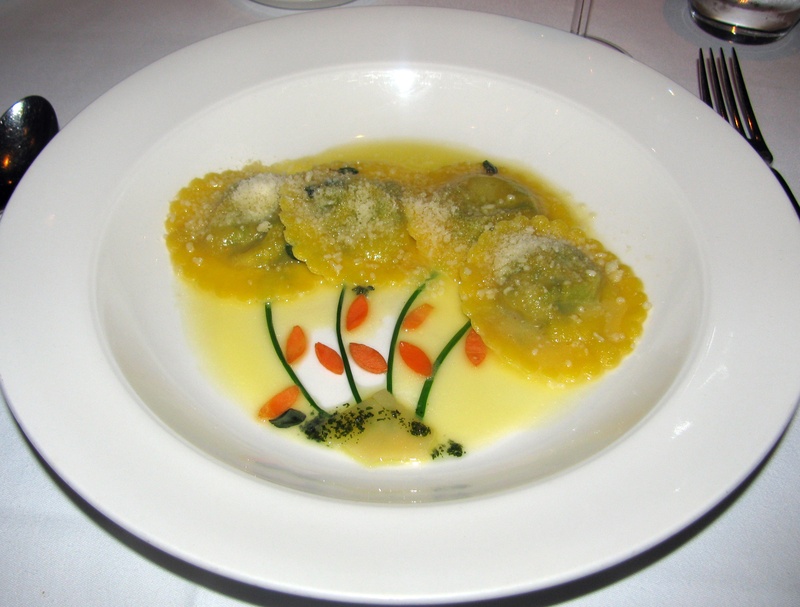 As an added incentive, each weekend the restaurant imports a plethoric variety of fresh fish – sole, branzino, snapper – along with veal chops and other specialties, to which the kitchen devotes all of its considerable culinary skills. OLIVE TREE MEDITERRANEAN GRILL, 379 West Uwchlan Avenue (Route 113), Downingtown, PA, (610) 873-7911, www.olivetreegrill.com: Tucked away on the ground floor of a diminutive office building, the Olive Tree’s exterior may appear a bit on the pedestrian side. Once across the threshold, however, you discover a contemporary, sparklingly clean dining area boasting comfy booths and large wall murals – and the homey Greek/Mediterranean cuisine is the perfect complement to the casual surroundings. 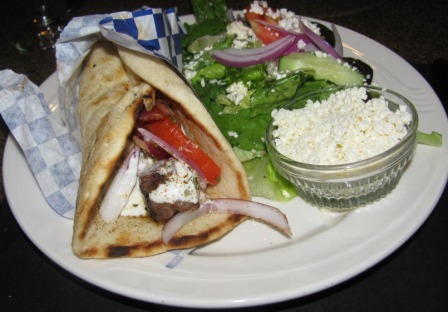 Both the lamb & chicken variations of souvlaki are excellent; and the same may be said for three classic Greek culinary presentations: spanakopita, moussaka, and pastitsio (a casserole of tubular pasta seasoned ground beef with tomato sauce and two rich, white sauces). But also be sure to sample my personal fave: mama’s makaroni, a provocative combo of warm penne pasta, slices of sautéed zucchini, sprinkling of crumbled feta cheese, and splash of white wine. For dessert, nothing beats the galatoboureko, layers of delicate phyllo filled with creamy custard and topped with a light honey/sugar syrup. REDHOUND GRILLE, 128 Paoli Pike, Paoli, PA, (484) 318-8047, www.redhoundgrille.com: Following a quick reconnaissance mission through the lively bar area, the Redhound may strike you as just another so-so-neighborhood “happy-tappy” – but you’d be dead wrong. In point of fact, the Redhound Grille is very much in the tradition of what has come to be known as a gastropub, a pub (bar) that gives as much attention to the quality of the cuisine served as it does to the quantity of the liquid libations dispensed. Sandwiches & burgers are excellent across the board, as are the salads & pastas. And don’t expect the roundup of usual suspects, as the kitchen always seems to add a little “twist” to tantalize your palate. The tomato mozzarella chicken sandwich, for example, is thoroughly invigorated with a shot of basil pesto; while the BLT is embellished with a generous slathering of zippy garlic mayo. When it comes to entrées proper, the fish ‘n’ chips does not disappoint… neither does a special of blackened salmon presented on an extraordinarily flavorful black bean compote. For dessert, when it is available, the peanut butter cheese cake is simply off the charts. 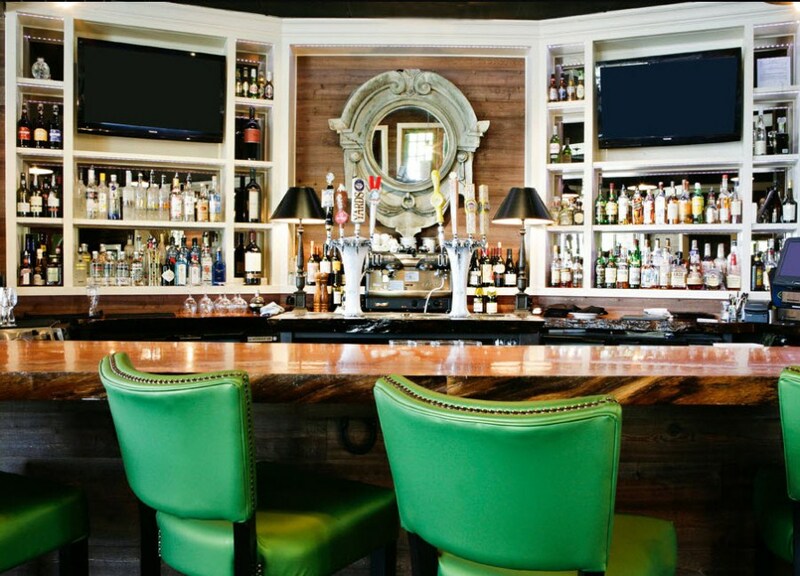 Individually owned, organically oriented, and committed to serving sustainable fish and local produce, the Redhound Grille is the perfect spot for a casual lunch, a satisfying dinner, or a happy-hour hiatus. 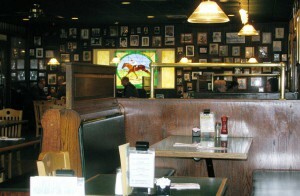 RON’S ORIGINAL BAR & GRILLE, 74 East Uwchlan Avenue (Route 113), Heritage Center, Exton, PA, (610) 594-9900, www.ronsoriginal.com: Ron’s is, well… unique – for a variety of reasons. Basically, their comestibles are organic & locally sourced whenever possible; and the restaurant is committed to cooking from scratch without relying on additives and preservatives. But not only is Ron’s food good for you… it tastes good as well. And that is certainly not a minor consideration. Among the grilled sandwiches, the house-made tuna salad melt presented on perfectly grilled rye bread is classic… as are the cornered beef, roast beef, and turkey Reubens. 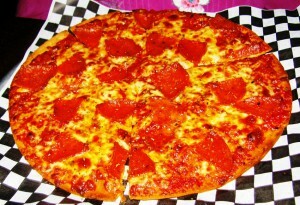 The thin crust pizzas are impossible to resist… ditto the “Ovals,” types of free-form thick crust pizzas that are unique to Ron’s. Entrées include a number of well-prepared Italian dishes, seafood, and a dynamite Black Angus meatloaf served up on a bed of garlic smashed potatoes. The restaurant contains several dining areas, but the bar, bustling yet inviting, provides the most comfortable seats in the house. 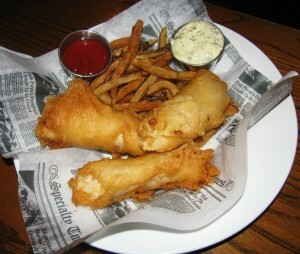 If you’re on the prowl for well-prepared casual fare that utilizes only top-notch ingredients and won’t break the bank, Ron’s Original Bar & Grille should fill the bill quite nicely. SIPS BISTRO & BAR, 400 Bridge Street, Phoenixville, PA, (484) 924-9721, www.sipsphoenixville.com: Ensconced in the ancient building that was most recently home to the Moon Saloon, Sips Bistro & Bar is surely a welcome addition to the Phoenixville dining scene. As you cross the threshold, the highly polished antique bar – shipped over from England in 1894 – clearly beckons, its rustic charm perfectly complemented by a series of sturdy high top tables & chairs. This is a warm, inviting space, so it’s quite easy to settle in and enjoy a house specialty cocktail. And Chef Gerald A. Petrus, Jr.’s, creative French fare is “bistro” in the very best sense of that term, utilizing pristinely fresh ingredients that are lovingly prepared and sent forth in attractive, soul-satisfyingly subtle presentations. To start things off, purists will not be disappointed in the restaurant’s traditional French offerings: pâté de champagne, charcuterie, and homey tartines, slices of buttered bread topped with Brie cheese, smoked salmon, and prosciutto & Gruyère, respectively. 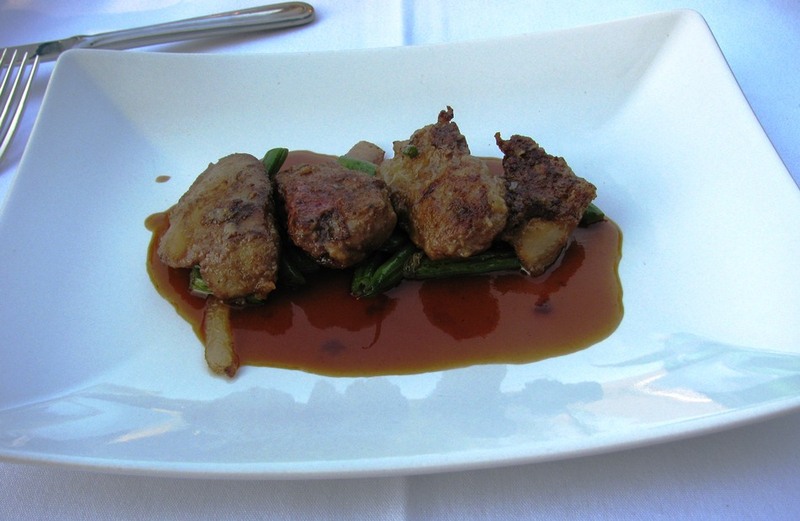 When it is available, however, nothing quite tops the special starter of sautéed chicken livers presented in an utterly superb red wine sauce. 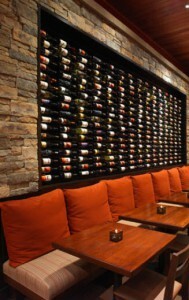 Entrées include steak frites, grilled salmon, signature bouillabaisse, and a variety of nightly specials. Innovative luncheon sandwiches and desserts are also highly recommended. THE SUMNEY, 1610 West Point Pike, Lansdale, PA, (215) 699-5693, www.thesumney.com: The Sumney bills itself as “An American Bistro with an Irish Accent…” but there’s certainly enough Gaelic gastronomy going on here to keep its many patrons happy. There’s Irish potato soup, Irish nachos, Irish potato skins, Irish fish ‘n’ chips, Irish farmhouse chicken, Irishman burger, and an Irish bash, a dessert of Irish cream mousse in a chocolate crust… and, of course, a host of Irish specialty coffees. But the really good news about The Sumney is its diversity. It offers diners a variety of exceedingly well executed “pub grub.” Sandwiches, like the grilled corned beef or turkey Reuben companioned by addictive house-made potato chips, are something of a must. 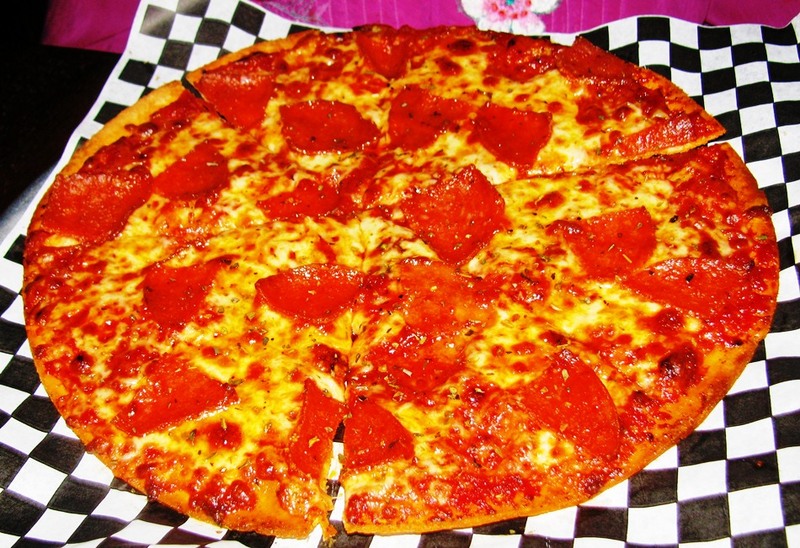 You may also choose from an appetizing assortment of salads, cheese steaks, and entrées. In addition, the restaurant serves up a hearty Irish country breakfast buffet each Sunday from 9:00 a.m. – 1:00 p.m.
WHITE DOG CAFÉ, 200 West Lancaster Avenue, Wayne, PA, (610) 225-3700, www.whitedog.com: The White Dog in Wayne is the younger sibling of the original White Dog Café founded in 1983 by social activist Judy Wicks on the campus of the University of Pennsylvania. In 2009, however, Ms. Wicks sold the original eatery to local restaurateur Marty Grims… who opened the Wayne location a year later. Despite the fallout caused by this transfer of ownership, one thing is apparent: Under Mr. Grims tutelage, the cuisine at both locations has improved dramatically. The sleek, modern Wayne White Dog, for example, offers diners such exquisite starters as DiBruno Bros mozzarella burratta (a blending of mozzarella & cream), a wonderful Kennett Square mushroom soup, spiced lamb sliders on mini brioche rolls, local artisan cheese, and house-made charcuterie. Entrées include the likes of pan-seared Arctic char, day boat scallops sautéed in caper brown butter, an incredible lamb Bolognese, and what I consider the establishment’s signature dish, a hefty wood-grilled Duroc pork chop. And lunch, in my opinion – replete with Green Meadow Farm cheddar burger, fried cod sandwich with lemon/caper remoulade, and a provocatively seasoned Vietnamese shrimp salad – is even more satisfying. The White Dog Wayne also serves up a marvelous, reasonably-priced happy hour menu Monday – Friday, 4:00 p.m. – 6:00 p.m.
During 2012, I also reviewed four (4) restaurants in New York City. These may be found by accessing http://www.artfuldiner.com/bitingbigapple.html. Here’s to more great dining in 2013! We appreciate your review and look forward to trying a few of the other restaurants you reviewed. Happy eating in the New Year!